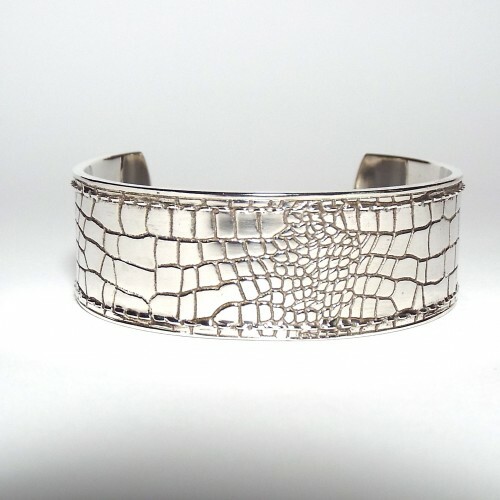 A Stylish and Classic Silver Cuff – with a Modern Twist. The surface of the cuff is embossed with the structure of crocodile leather. The perfect accessory to add some timeless and classy glamour to any outfit. It can be worn with a minimalist business outfit as well as a relaxed weekend outfit! The cuff is handmade of solid 925 Sterling Silver, is hallmarked by the London Assay Office and carries the maker’s mark ‘MMzS’. Dimensions: The inside measurements are 4.5cm x 6cm. The cuff is evenly 2cm wide, 1.9mm thick and has an oval shape. The opening is 2.75cm wide and can be slightly adjusted if necessary. Material: 925 Sterling silver. The cuff weighs 42.5 grams.